As for myself, I wanted to be engaged with the world, living life to the fullest, so clearly I did not have a vocation. But then I met the Jesuit priests at Creighton University where I was studying pharmacy. The Jesuits witnessed for me how a religious vocation is a gift to the world-their availability to service, their spirituality that grounded the scattered pressures of daily life, their fraternity of supporting each other in prayer and mission-this was a life for others. Now I had ears to hear God’s persistent call, but there were still the things I feared so much to give up-my careful plans for my future, my dreams for marriage, my ideas about how my life would go. Still, God kept calling-in spring flowers and songs on the radio and moments of Eucharistic Adoration. “Do you trust Me? Then give Me your life, and see what plans I have for you." I heard Him say. Finally, I gave in and searched online for religious communities, started visiting, and realized what joy was waiting for me in belonging totally to Jesus. I came across the website of the Apostles of the Sacred Heart of Jesus and immediately felt my heart stir at the motto from St. Paul: “the Love of Christ Urges Us On!” Yes, this was the love that I had experienced and that was propelling me to a life dedicated to love. By a huge outpouring of grace, my heart refused to settle for less. So, I left my plans, quit the pharmacy program, and entered the Apostles in 2006. God is faithful, and as Pope Benedict said, Christ actually asked me for nothing in comparison with what He continues to give me. 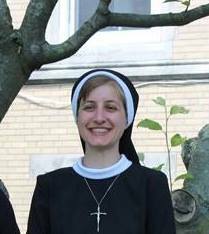 With a joy and peace I could only have imagined, I professed perpetual vows as an Apostle of the Sacred Heart of Jesus in 2014. God’s ways are not our ways-but they are even better! 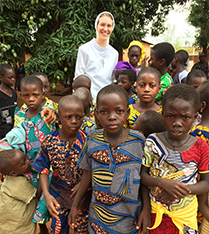 Some religious sisters sense their vocation in childhood. My path, however, had more twists and turns. Being a sister wasn’t even an option when I was growing up. My loving parents rarely talked about religion. As a teenager, I became skeptical of any faith that went beyond scientific proof. Yet I occasionally attended church with my paternal grandparents, faithful Protestant Christians, and felt a longing for something deeper that I couldn’t push away. After my first year at Washington University in St. Louis, my beloved grandmother died suddenly, and my quest to figure out my beliefs became more urgent. I longed to be a self-sufficient adult yet was beginning to realize that I desperately needed God and other people. Maybe there were good reasons to accept Jesus and his resurrection, even if it went beyond science. After long searching and prayer for guidance, I awoke one morning with a clear sense that God was directing me to the Catholic Church. I got up the nerve to go to the Catholic Student Center and found out about RCIA. The welcoming community preached God’s unconditional love to me in a new way. While watching the congregation receive communion, I had a powerful sense that the Eucharist is Jesus, the Body of Christ given to the Body of Christ. From then on, I longed to receive him. I fell in love with God! My baptism at the Easter Vigil was amazing beyond words...and so was receiving the Eucharist and knowing that Jesus was truly inside of me! I became active at the Catholic Student Center and even gave a year of post-graduate service as a campus ministry intern. During that year, I met Sr. Virginia Herbers, an Apostle of the Sacred Heart of Jesus, who was also working in campus ministry part-time. But then I accepted my dream job offer: working in the offices of the Chicago Symphony Orchestra. I got an apartment with my best friend, found an active parish, and loved life in Chicago. I even found out I could walk to daily mass during my lunch break. Yet gradually, I felt a nagging sense that I was living my second-best life. When I came across a passage from scripture, “I remember...how you loved me as a bride” (Jeremiah 2:2), I got the sense that Christ wanted me to marry him in religious life. But I knew hardly any sisters and immediately pushed back in denial. How could I, an only child, do this to my parents who weren’t even Catholic? After months of resistance, I realized that I could not be at peace on another path unless I explored this tug toward religious life. I contacted the few sisters I knew, including Sr. Virginia. When we spoke on the phone, she asked me, “Is this search more about what you do, or about who you are?” “Who I am,” I answered without hesitation. As I met and spent time with more Apostles of the Sacred Heart of Jesus, I was deeply struck by who they are: by the joy, warmth, and humanity that flows from their commitment to Christ. Jesus led me gently, one step at a time. One night as I prayed with the Divine Mercy image, the rays of blood and water flowing from Christ’s heart captivated me. I could sense him saying, “I want you in my heart.” And so many aspects of Sacred Heart devotion resonated with my experience: Jesus the shepherd who led me, who loved me in all my weakness and sin, who cleansed me in baptism and poured himself out for me in the Eucharist...and who was calling me to share his love in a new way. I still resisted that call, but finally I went for a longer visit with the Apostles at Clelian Heights in Greensburg, Pennsylvania. During that time, I had a deep sense that I was at home, that my searching heart had found rest. 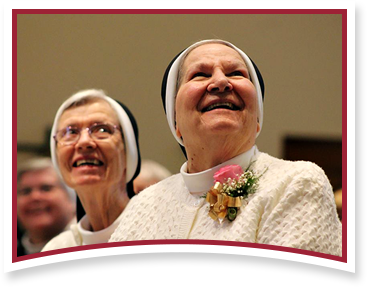 Watching the sisters and their varied personalities, I knew that I could be an Apostle of the Sacred Heart of Jesus and be myself. I was finally ready to say yes to God. Whatever your vocation is, God wants to lead you on the path that will help you become more fully yourself. I pray that you will follow wherever God’s “foolish wisdom” leads you. It means to "Share God's love with all His people." I will never forget the day I heard those words for the first time from Sr. Susan Marie Krupp, an Apostle of the Sacred Heart of Jesus. It was a hot, sunny day in Florida and we were chatting on a bench outside St. John Paul II Catholic High School. I was a college student at Florida State University and she had just asked me if I'd like to hear the Apostle's charism (gift the Holy Spirit gives to a founder/foundress to begin a religious Congregation). I told her with a little hesitation, "Okay..."
The reason I had hesitation was because I had discerned with several different communities and didn't feel as though I "clicked" with any. I was frustrated and discouraged. I was beginning to think God had called me to be a sister, but didn't have a congregation in mind for me. What I didn't realize is that the missing puzzle piece of my life was staring me straight in the face! As I listened to this sister describe the charism of the Apostles, I felt the Holy Spirit moving in me. I almost heard a voice saying, "This is it! This is what you've always wanted to do!" I couldn't believe it was so simple: To share God's love with all His people. But the message resonated within my heart. I had been on a powerful retreat a few years before, and after experiencing God's love in a profound way in Eucharistic adoration, I found myself saying to God, "How could I possibly give back to you all you've given to me?" I found God saying to me, "You could give your life to me." Gulp! My life? What? How about something a bit smaller? I then began the quest of discovering how I could give my life back to God. I recognize in hindsight that God simply wants us to give our lives back to Him every day, in the little ways. But I couldn't shake that God wanted me to give my life to Him...in a big way. I think a vocation to religious life is a big gift from God. It is not easy, in fact it is almost completely counter-cultural. I suppose that is why it is called a grace. 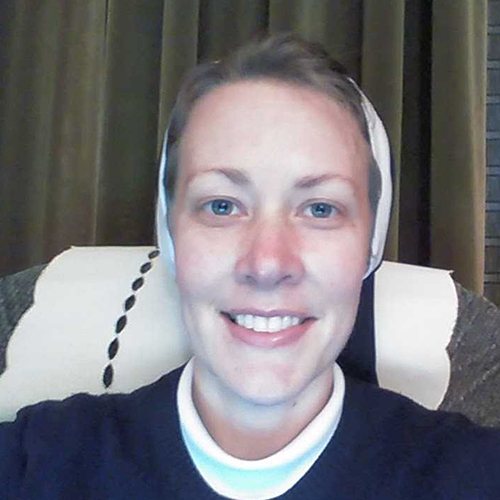 I have been graced with a religious vocation, but it has been discerned communally. In other words, I have shared this desire for religious life with many spiritual directors who helped me respond to this call from God. We need other people to help us navigate the deep desires of our hearts. I am so grateful for this life. I will pray for you as you discover your own vocation! In the meantime, let us follow St. Therese of Lisieux's advice: "My vocation is to love." Are you interested in participating in upcoming vocation events? Please visit our event registration page.